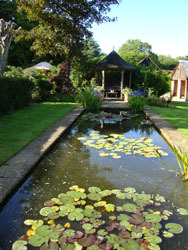 Welcome to the garden of Chesham Bois House which extends to about 3 acres. It is normally very peaceful as the tree lined drive between Bois Lane and the house shuts out most noise except for the occasional plane from Heathrow overhead and of course the birds. The garden is made up of a variety of spaces. There are two long vistas, one facing east and the other south which consists of a gazebo, a small ornamental canal and rill and in the distance is a fairly new meadow area with tall grasses on either side leading to a seat in the arbour. The whole garden can be viewed from many different aspects which contains the same elements but looks very different. 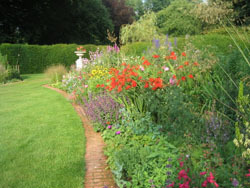 The house is surrounded on all 4 sides by the gardens and on the north side is the walled garden which contains varieties of salvias and plants which love the dry conditions. On the sheltered south side of the house the terrace is planted with succulents including echeverias and aeoniums. The old orchard with a few of the remaining apple trees now has a pond created in 2010/11 with a pebble 'beach' so the wildlife can get in and out easily. In the spring the orchard is a mass of snowdrops and t the far end are some trees grown for their interesting bark. There are a variety of old and new trees some of which are toparied as well as some handsome copper beeches and two mulberry trees, black and white, the latter grown from seed. An enormous sycamore tree grows in the field at the back of the garden and can be seen if a short walk is taken over the 300 year bowling green, now no longer used. A summerhouse where teas are served on open days and the planting is mostly in dark purple and bluey-green.